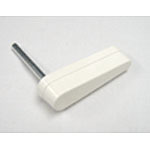 Replacement 3-inch white plastic flipper with built-in metal shaft. Used on Bally games approx. 1970-1987, Stern games approx. 1977-1985, Chicago Coin, Game Plan, and most Atari pinball games. Can be used on some other makes/models that use this same style flipper bat/shaft. This modern one-piece flipper bat/shaft design replaces old 2-piece designs used on some of these older games. Replaces Bally part numbers C-611-5, A-2747-11, AS-2814-25, AS-2214-19, AS-2214-21, AS-2214-24, ASE-2214-21, ASE-2214-24, ASE-2214-28, Midway A967-00031-0000, Stern A-192, Chicago Coin 4B-122W, 468-2512, and others. We recommend replacing all flippers in your game at the same time to avoid unsightly differences in shade between new and old faded white plastic flippers. Shade of color on this replacement part may differ slightly from shade of your original part(s), and/or other replacement parts you may be purchasing at the same time, due to age, exposure to U/V light on original parts over the decades, and due to slight variations in shade from batch to batch by the manufacturer. If you have any specific requirements regarding color matching, please e-mail us before ordering. These parts are made to go on old used pinball machines- not on the atomic clock.